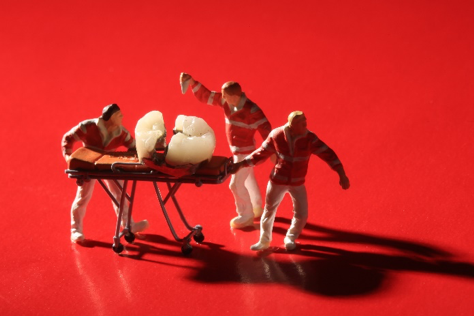 There are a variety of reasons someone may experience a dental injury. The injury can stem from severe causes such as automobile accidents and falls to simple normal wear and tear or biting down on hard objects, like candies. The good news is, while many dental injuries are painful, they’re usually not life-threatening. Broken teeth, fractures in the teeth, swollen gums, and their associated symptoms can often be alleviated with painkillers and cold packs. Place the pack on the outside of the mouth to reduce swelling until you can be seen by your dentist. Some dental injuries are coupled with more serious injuries. For example, as a result of a car accident, head trauma or internal injuries would be top priority. Once a patient is stable, then the mouth damage can be assessed, and treatment considered. You’re probably not reading this blog in the middle of a true dental emergency. However, should you have one; such as you’re having issues breathing or notice visible swelling, call 911 or visit your nearest emergency room. If you have pain in your tooth, teeth, tongue, mouth, or jaw and it isn’t a dental emergency, contact your dentist as soon as possible to schedule an appointment. In addition to providing tips through these posts, we’re also pleased to offer a FREE report that offers important dental information. Why not get your copy now? The Consumer’s Guide to Straighter, Whiter Teeth is just a click away. And it’s absolutely FREE. If you need further information, want to make an appointment, or have a question answered, you’re more than welcome to call us at Airdrie Springs Dentist at 587 317 4161 or click here to visit our website.